The morning was one of the brightest spring days of the year so far. 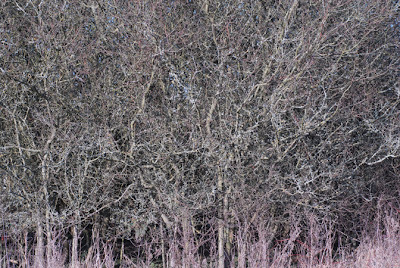 Since January 3rd, my wife Amanda has been taking a photograph of exactly the same view of a field near where we live. Since being shown Teloschistes chrysophthalmus just north of Brighton, we have been keeping our eyes open for it. This morning, having taken her photograph, Amanda was struck by the assemblage of lichens, including the golden Xanthoria species that seem to be associated with Teloschistes chrysophthalmus growing on a blackthorn bush nearby. She went over to give the bush a casual look. After perhaps half a minute, the air went blue. “What’s the matter.” I replied, furrowing my brow in concern. “Come and see!” she said. “I’m not sure I want to see something that’s not too pleasant,” I added. “You’ll like this,” she replied enthusiastically. 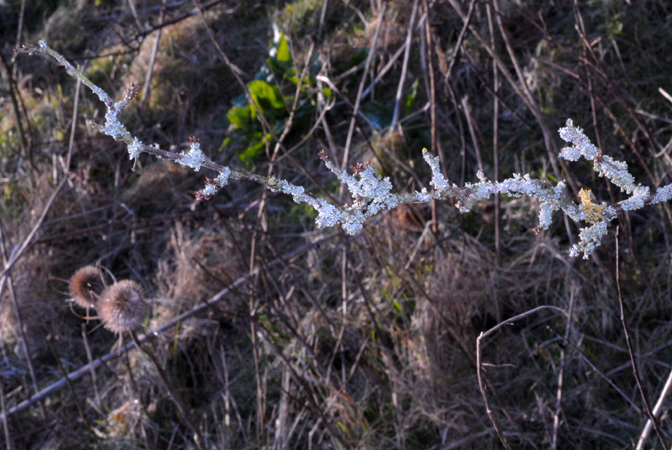 I walked over to where she was standing, and she pointed to a very small, very fertile orange coloured lichen. Indeed, the fruits seemed to be raised on definite branches, and I could see what I thought were eye-lash like cilia surrounding the fruit. It looked very promising. Amanda dashed inside to get my hand lens and camera. Moments later, I was able to confirm our suspicions with my hand lens. The lichen was very small, but I was in no doubt whatsoever that this was indeed the beautiful Golden-eyed Lichen Teloschistes chrysophthalmus and the second record of it for East Sussex and one of the mounting number of sightings in southern England since October last year. Recently, Amanda and I have been looking at bushes that have twigs that are golden with species of the genus Xanthoria. We looked at many just outside Newhaven but failed to find the Teloschistes. A common factor that seems to be emerging is that the twigs and branches of Teloschistes-bearing bushes may be golden, but another feature is the presence of a rich diversity of other, grey, lichens, and especially the two fruticose species Ramalina farinacea and fastigiata. 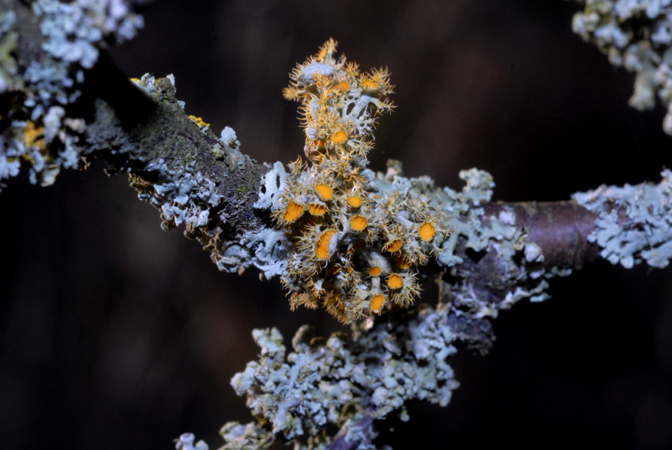 The common lichen so highly indicative of high levels of nitrogen compounds Xanthoria polycarpa is invariably present and growing luxuriantly. It closely resembles Teloschistes but lacks the “eye-lashes”. Although the abundant fruits seem to spring up from the surrounding lichen, they are not borne on real stalks as in Teloschistes. However, the Xanthoria polycarpa does make small samples of Teloschistes chrysophthalmus very hard to spot. Our site….yes I truly believe I can refer to it as that…..is on the edge of a rich piece of unimproved pasture supporting such flowering plants as Pepper Saxifrage Silaum silaus and Sneezewort Achillea ptarmica both indicators of species rich meadows. Burnet moths and Marbled White butterflies are also present. It has been suggested that Teloschistes chrysophthalmus is associated with improved pasture and perhaps even dog walking. Both these features are not prominent in the meadow we know. We are also approximately ten miles north of the sea, and the ridge of the Downs separates us from it, so this is another factor that this morning’s finding shows; the lichen does not require to be blasted by high, coastal winds as suggested in my previous blog. 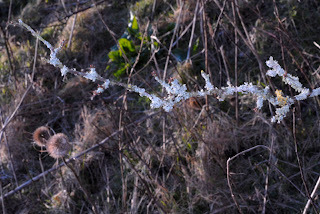 The lichen grows about a foot back from the growing tip of a twig. Healthy buds on the twig confirm that it is still alive, which is a relief. I estimate that the age of the twig on which it is growing is probably four years. It is unfortunate that the exact time on which it became established can never be known, however it has to be recent. As it grows so close to our home, it will be a fascinating study to watch any developments, and I plan to take regular photographs of it, and to make extensive searches on all bushes in our area. Teloschistes chrysophthalmus is not the only exciting lichen to have put in a recent appearance in Sussex. In 1993, I went with Dr Francis Rose to Ashurst Church to look at lichens. The north side of churches is often the most exciting part of a churchyard, and on this occasion, Francis Rose noticed a pink coloured, powdery crust. He collected a small sample, and sent it off for an opinion. The expert opinion was that it was just a variant of the very common lichen Dirina massiliense ssp. sorediata. 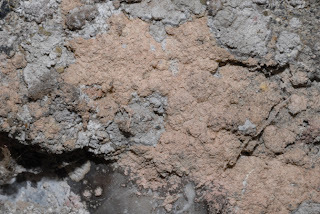 Since then, a new species has been described called Llimonia sorediata, and it is described as being a pink, powdery crust. In July last year, I went to Ashurst Church, and was able to collect a small bit of the lichen that had spread onto a small piece of dead ivy twig. I sent it off to a friend who is very familiar with the species in Wales. He confirmed it as Llimonia sorediata, the first record for Sussex, and the furthest east it has ever been seen. Very recently, I have been going through my photographs and found one of lichens growing on the north wall of Hooe Church in East Sussex. Ashurst is in West Sussex. In a photograph I had taken of Lecanactis grumulosa the lichen which, when on churches used to be thought to be distinct, and had been named Lecanactis hemisphaerica, there was a pink powder. Though it cannot be positively identified from a photograph, it seems likely that this species, which is Nationally Scarce may have its first record for East Sussex.